Thomas Kolding missing: Mountain Lakes NJ teen mystery whereabouts. Pictured missing Mouintain Lakes, NJ teen, Thomas Kolding- last seen over the weekend in Camden, PA as caught by CCTV footage. Thomas Kolding missing: Concern for the wellbeing and whereabouts of a Mouintain Lakes, NJ teen who fled home with $1K savings following argument with his father over school grades. The parents of a 15 year old New Jersey boy who left the family’s Mouintain Lakes home after leaving a note that he didn’t want to be found have been left dumbfounded. It’s been just on 8 days since Thomas Kolding, armed with $1000 of his savings and having left his cellphone behind, seemingly vanished from the family home- during which time the son has not been heard from since. The Morristown Daily Record reported the teen last seen October 30 at the family home and disappearing soon after, following an argument with his father over school grades. ‘The argument about his grades may have been the trigger. I was trying to motivate him and get him to live up to his potential,’ his father, Nicolai Kolding, told the media outlet. Left in the teen’s room was a handwritten note, informed his parents that he didn’t want to be found. The Mountain Lakes High School freshman had earned $1,000 in cash shoveling snow, mowing lawns and pet-sitting for neighbors. 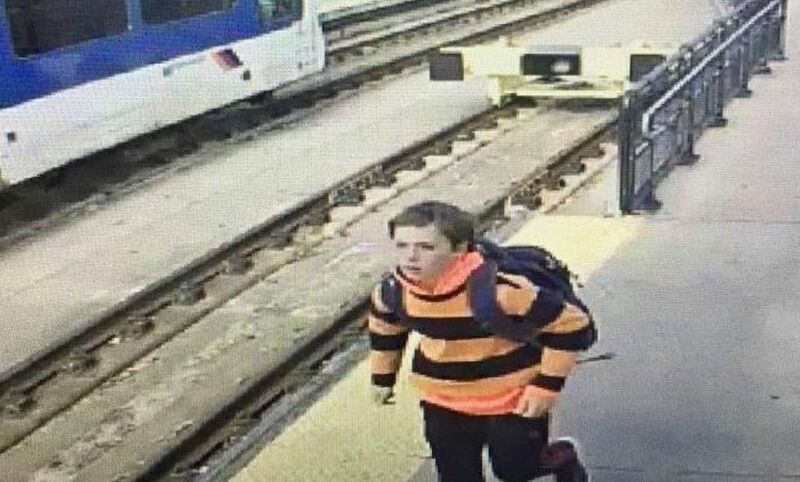 Mountain Lakes Police, working alongside Morris County Prosecutor’s Office, believe Thomas rode his bicycle to Denville train station, where he boarded a train to Newark. CCTV footage of Thomas at Broad Street station on October 30 has been obtained. Police then believe the missing teen caught a train to New York’s Penn Station. Footage of the boy arriving at NY’s Penn has yet to identify the missing teen on CCTV footage. Kolding said his son is an avid traveller after he was encouraged to be independent from an early age. Earlier this year, the family allowed Thomas to return from Norway to the US by himself. ‘He’s a wonderful, amazing kid, and we want him home. He’s never been any trouble, and we’re so impressed and in awe of him and his ambition,’ the father added of his missing son. To date police have no leads with authorities saying searches for Thomas are ‘merely exhausting all investigative options’. Thomas father in the days after his teen son’s disappearance questioned whether Thomas may have sought traveling to California, following internet history on his laptop indicating ‘some research’ research. Nevertheless Nicolai Kolding conceded the family not know if Thomas was out west, hiding nearby or in New York City. Thomas Kolding missing: An appeal for their son’s safe return. Taking to social media, Thomas’ mother, Aleksandra Kolding, plead for her son’s whereabouts and return. ‘He is a wonderful, resourceful, and far-too-adventurous young man who we are worried about beyond words,‘ the teen’s mother posted, November 3. ‘Please keep spreading the word and tell all to look for a very LARGE BLACK BACKPACK he has on him – I think that’s the telltale sign for those that don’t recognise him,’ she added. The latest update includes Thomas having been spotted in Camden, NJ and Philadelphia this past Saturday. Nevertheless Thomas parents concede having no further information. Adding, ‘We’re buoyed by the news. We’re heartened by it. This was a very important sighting, and it looks as though he’s in control’. Anyone with information who may be seeking to remain anonymous can contact Morris County Crimestoppers at 1-800-743-7433.